Penicillium, Aspergillus, and Fusarium spp. isolated from maize grain have been found to be significantly influenced by aw, temperature, and their interactions. The effects of aw and temperature on germination can be quantified in two ways: (a) the minimum aw for germination and (b) the lag time before germination. Fungi normally found in stored grain can germinate at lower aw levels than the fungi present in the field, especially in temperate grains (Table 1). Changes in tolerance to low aw occur when changing temperature level. A. niger germinates only down to 0.95 at 10°C, but down to 0.90 at 15°C, and to 0.80 at 25°C. P. hordei germinates down to 0.90 at 5°C, but down to 0.85 at 25°C. F. verticillioides germinates only down to 0.96 at 5°C, but down to 0.88 at 25°C (Marin et al. 1996, 1998a). Source: Magan and Lacey (1984a). very fast can be an advantage in competing effectively with other fungi for nutrients in the grain and exclude other competitors. Also, conidia can survive for long periods of time depending on the relative humidity and temperature. All of this information gives us an idea about the potential capability to colonize the stored grain ecosystem if the conditions change and become favorable for fungal development. 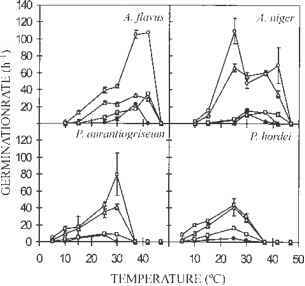 Figure 3 Effect of water activity and temperature on the germination rate of A. flavus, A. niger, P. aurantiogriseum, and P. hordei on MMEA. Water activity levels are 0.994 (O), 0.95 (K), 0.90 (□), 0.85 (•), and 0.80 (O). Error bars show standard error of estimated parameters [from Marin et al. (1996)]. Successful spore germination results in the formation of extending hyphae that are able to colonize the substrate. Hydrolytic enzymes are produced to utilize the rich nutritional substrate. Water activity and temperature are very important factors impacting on the level of infection of the grain and the extent of colonization. The interaction between these factors is critical in developing an understanding of the ecology of individual species, their interrelationship with one another, and their role in initiation of molding. The range of aw/temperature conditions for germination is generally found to be wider than that for mycelial growth, as recently shown for fumonisin-producing species of Fusarium from maize, and for other Aspergillus and Penicillium spp. (Magan and Lacey 1984a; Marin et al. 1996). Changing aw at different steady-state temperatures affected growth rates of all the species examined (Marin et al. 1996, 1998a). Fusarium species grow faster on irradiated maize at 25°C than at 15°C. Maximum growth rates of about 3.6, 3.5, and 10.4mm/d were obtained for F. verticillioides, F. proliferatum, and F. graminearum, respectively, at 0.98 aw and 25°C. However, these three species had a growth rate of about 0.4, 0.5, and 1.2 mm/d at 0.93 aw and 15°C, respectively (Marin et al. 1998b). While most fungi grow optimally close to 1.00 aw at their optimum growth temperature, others grow better at lower aw. For instance, Eurotium amstelodami, E. repens, A. niger and A. versicolor and A. ochraceus all grow faster at 0.90-0.95 aw at optimum temperatures (Ayerst 1965; Magan and Lacey 1984a; Ramos et al. 1999a,b). Some Penicillium spp. 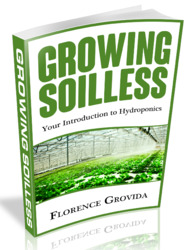 also grow better nearer to 0.98 than at 1.00 aw (Hocking and Pitt 1979). However, at marginal temperatures for growth, optima are almost always close to 1.00 aw. The effects of aw and temperature on fungal growth and other activities in stored grain may be further modified by changes in the concentration of O2 and CO2 in the intergranular atmosphere resulting from respiration (Magan and Lacey 1984b), and the addition of preservatives (Marin et al. 1999b). The production of mycotoxins has been studied mostly at optimum aw and temperature levels on either rich laboratory media or on autoclaved wheat, barley, or rice. Few studies have considered the effects of environmental factors, especially water stress on mycotoxin production. The conditions of aw/temperature that permit mycotoxin production differ from those for the fungal growth (Table 2). For instance, F. verticillioides and F. proliferatum, at minimum aw/temperature for growth (e.g., 0.89-0.91 aw) did not produce detectable levels of FB1 (Marin et al. 1999a). 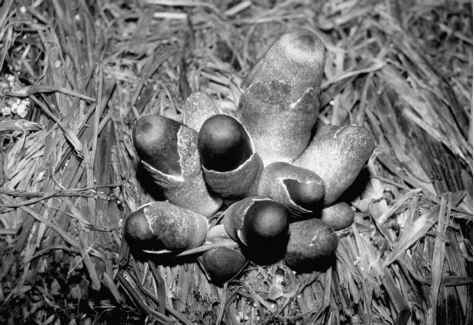 The minimum aw allowing growth of 12 species of fungi was usually lower and the temperature range wider than those permitting aflatoxin, patulin, penicillic acid, ochratoxin, or fumonisins production (Marin et al 1999a,c; Northolt 1979). Moreover, the effect of these factors can differ for two toxins produced by the same species. For instance, ochratoxin production by A. ochraceus on poultry feed was greatest at 30°C and 0.95 aw while penicillic acid production was favored by 22°C and 0.90 aw.